Degenerative disc disease causes spontaneous degeneration of the outer part of the disc, resulting in sudden disc rupture or herniation (also called a “slipped disc”). It may not be related to injury, although the rupture frequently occurs after some sort of traumatic event, such as a fall or a relatively small jump. Although this act is frequently blamed for the disc rupture, the injury actually occurred due to chronic disc degeneration. 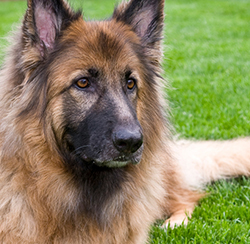 Most dogs with degenerative disc disease are middle-aged, from three to seven years old. There is likely a genetic predisposition to this disease. Certain breeds, especially the Dachshund, Poodle, Pekinese, Lhasa Apso, German shepherd, Doberman and Cocker Spaniel have a high incidence of intervertebral disc disease. When the outer shell degenerates, it allows the central part of the disc to escape. Since the disc is thinnest near the spinal cord, disc material that escapes through the tear usually goes upward, putting pressure on the spinal cord. Because the spinal cord is encased within its bony canal, it cannot move away from the pressure and it becomes “pinched”. The spinal cord is like a telephone cable carrying thousands of tiny wires. When it is crushed, transmission of information through the wires is slowed or stopped. When the disc degenerates and ruptures, it crushes the spinal cord and the nerves that leave the spinal cord over the discs (i.e. spinal nerves). Pressure on the spinal nerves results in pain. Pressure on the spinal cord results in pain and/or loss of information transmission, causing partial or complete paralysis. 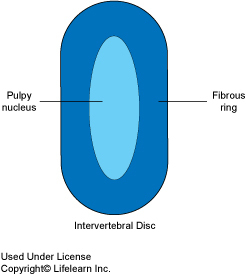 Disc degeneration occurs relatively slowly, and a rupture may occur slowly and gradually, so that degenerated disc material slowly escapes from the disc over several days or weeks. In these cases, the dog often experiences pain and is reluctant to move. It may lie around for a few days allowing the body to try to heal the injury, often without the owner being aware that a problem existed. However, discs may also rupture very acutely. Some dogs will go from normal walking to total paralysis in less than one hour. A presumptive diagnosis of disc disease will be based on the dog’s history of neck or back pain, uncoordinated walking, or paralysis, with or without a history of recent trauma. If the dog is one of the high incidence breeds, this disease will be high on the list of potential causes of the patient’s symptoms. In some cases, plain radiographs (x-rays) may assist the diagnosis. However, plain radiographs may show no abnormalities, since neither the disc nor the spinal cord is readily visible on an x-ray. If the diagnosis is in doubt or if the patient will undergo surgery, a myelogram may be performed. This procedure involves injecting a special dye around the spinal cord of the anesthetized dog and then taking a series of radiographs. The dye will outline the spinal cord. A break in the dye column means that there is pressure on the spinal cord at that point. If available, computed tomography (CT) scans and magnetic resonance imaging (MRI) may be used to diagnose intervertebral disc herniation. These stages tend to overlap in some dogs, and dogs may move from one stage to another over a period of hours to days. Dogs with Stage II and III disease are usually treated with anti-inflammatory drugs, pain relievers, and exercise restriction. If the pain or lack of coordinated movements persists after four to seven days of treatment or if the neurological status declines from one day to the next, surgery may be required. The time of confinement will vary based on each patient’s condition. The goal of surgery is to remove pressure from the spinal cord. 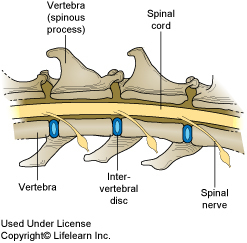 If the disc rupture occurs in the lower back, a “window” (called a fenestration) is made in the side of the vertebral bone to expose the spinal cord. This window allows removal of disc material and relieves pressure from the cord. 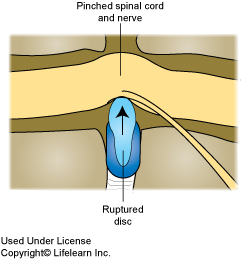 If the disc rupture occurs in the neck, a window is made in the bone exposing the spinal cord. This may be done from either the top or the bottom, depending on the situation and the veterinarian’s preference. Unfortunately, success cannot be determined immediately. The return of neurological function, walking ability and relief from pain may not occur for several days to weeks after surgery. The answer is “yes”. However, as discussed above, not all disc herniations require surgery. This entry was posted in Uncategorized and tagged dogs, joint health. Bookmark the permalink.